Spring Math Fact Fluency | Double Digit Addition and Subtraction, Money & More! 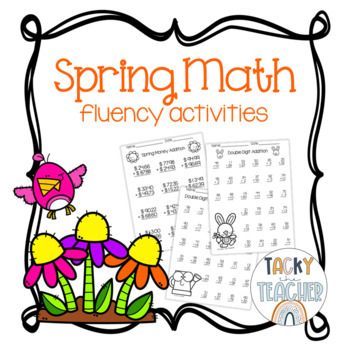 This Spring Math Fluency Pack has a variety of engaging activities (36 pages!) with absolutely NO PREP! I created it because I needed a fun and engaging way to practice math fact fluency with my students. This pack has adorable spring graphics (bugs, bunnies, rain cloud and boots, a sun, rainbow, bird and birdhouse, trees, flowers, and more!) perfect for March, April, May, and June math activities! My goal was to create a resource that was print and go! And all of the worksheets are in black and white to save on ink! ★ Pick and choose which pages you want to do, print, and you're all set! You can time students for several minutes to see how many math fact fluency problems they can do, and use to inform instruction. Or they can complete it as a math center or during morning work. Check out my other resources available on TpT! ★ Doing an author study on Dr. Seuss? Here are some Dr. Seuss ABC Book literacy activities and Dr. Seuss Sleep Book rhyming and writing activities! ★ And don't forget my St. Patrick's Day Math & Literacy Pack! Would you like to have access to this and other teaching resources? Stop by and visit my blog for a peek!